You can enable these features when logging in to the Oracle VM Manager user interface or you can set or change the accessibility options once you have logged in. 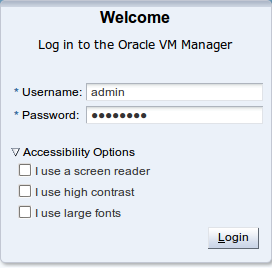 On the login page of the Oracle VM Manager user interface, click the arrow to expand Accessibility Options. In the Global Links at the top of the right-hand-side of the Oracle VM Manager user interface, click Settings.